Proper illumination is important in a kitchen to enable you to work efficiently when you are cooking, reading, dining or entertaining. Kitchen lighting should be planned by design. 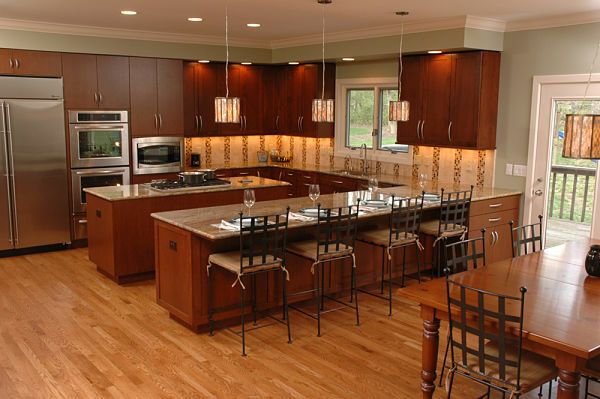 When you think of lighting in a kitchen consider illumination during daylight and evening hours. Many kitchens have a window over a sink by design to provide a source of natural light during the daytime. A kitchen may also be centrally located without a direct source of natural light and may require artificial lighting throughout the day. Homes built prior to 1990 often had a large single light fixture placed in the middle of the kitchen ceiling for general lighting. While the center of the room was bright, corners and counter areas were dim. General lighting in today’s kitchens is still installed on a ceiling but is diffused throughout the room. General lighting is most commonly provided by recessed light cans placed 4 to 6 feet apart. Recessed lights come in 4-inch and 6-inch sizes and in a variety of trim options. Task lighting can be provided by strategic placement of recessed lights, undercabinet lights, lights built into appliances and pendants. Undercabinet lights are functional and attractive in a kitchen. 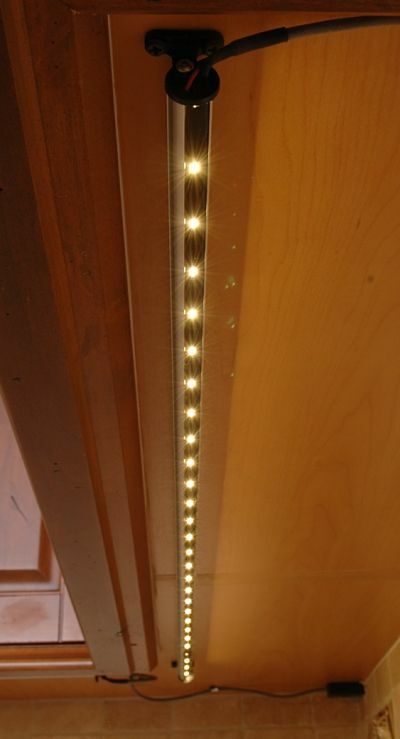 There are three basic types of undercabinet light fixtures: strip lights, puck lights and linear lights. Bulbs used in undercabinet fixtures include florescent, LED, Halogen and Xenon. Consumer Reports tested various types of undercabinet lights and recommends using a 12-inch fixture for every 4 feet of counter space. Fixtures come in sizes ranging from 9 inches to about 4 feet to fit under a variety of cabinets and configurations. When selecting undercabinet lights it’s important to consider your counter surface due the reflective glare that can occur when the light shines down on the surface. A frosted lens can be used to minimize glare and puck lights should not be used on dark glossy surfaces. 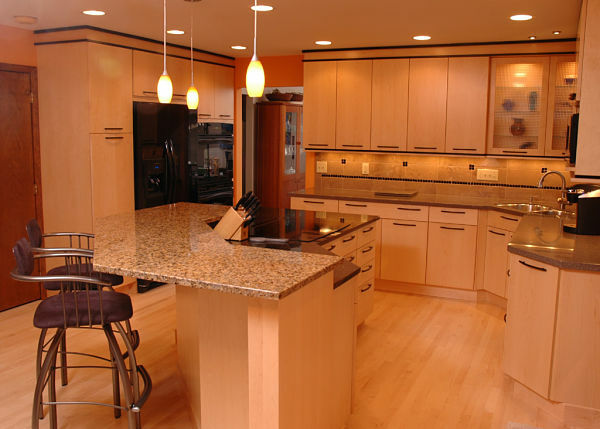 LED lights work best over dulled surfaces such as honed granite, Corian or laminate. Puck lights installed in upper cabinets with glass doors add ambient lighting to a kitchen. Glass shelves allow light to shine through a cabinet and illuminate contents. 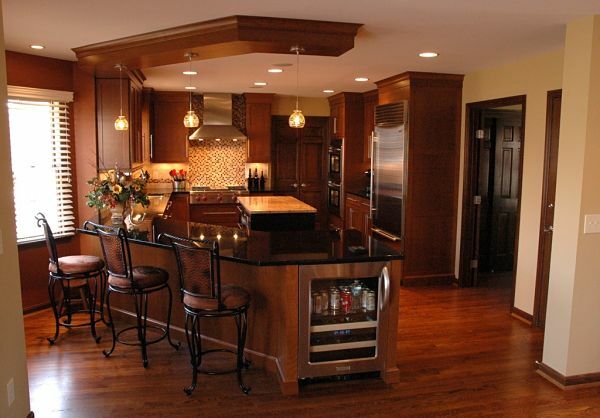 Accent lighting can be used in a kitchen to highlight architectural features and items that you want to display. 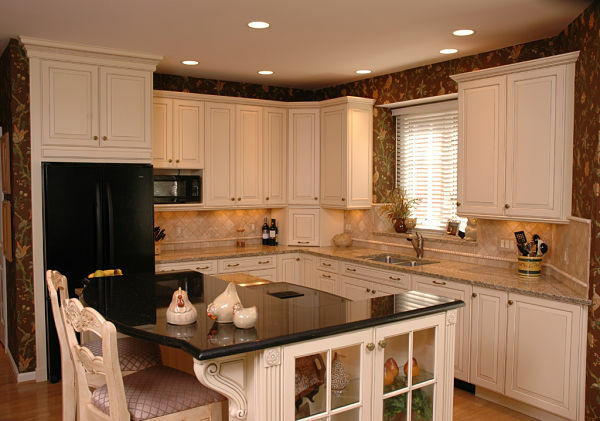 Uplights can be used on the tops of cabinets. Adjustable spotlights can be used to show the contents of an open cabinet or shelf. Lights can also be placed over artwork. Since accent lights are used for ambiance and display it is best to have them installed with a dimmer switch. Pendants and chandeliers are the jewels of a kitchen. 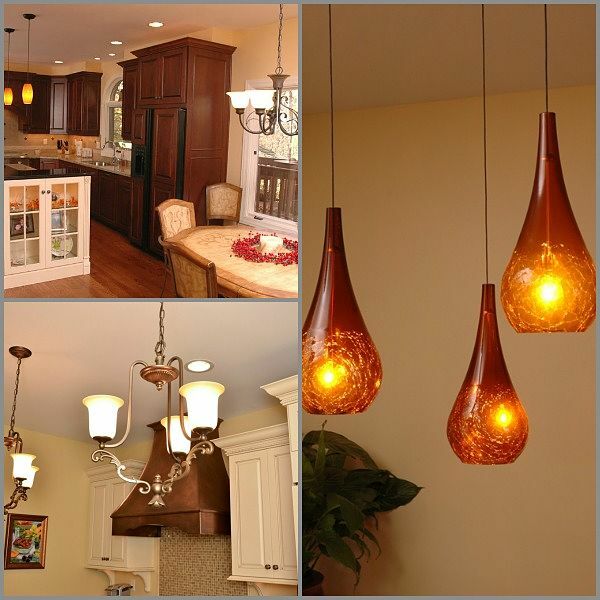 Pendants can be installed over islands and peninsulas in a variety of configurations. Often pendants are installed in groups of three. 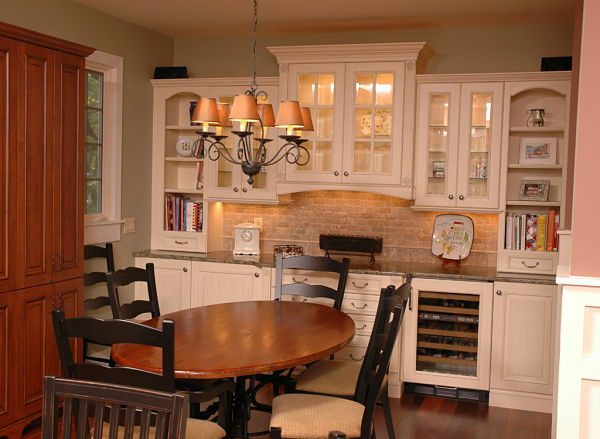 When using pendants and chandeliers for your kitchen keep in mind that the fixture can either be a downlight that will shine directly on a surface or an uplight that radiates light toward the ceiling.